Poster summary: "Uric acid (UA) is known as the main antioxidant in the blood. However, elevated serum uric acid (SUA) called hyperuricemia and causing gout has been linked to diabetes mellitus (DM). Loss of viable pancreaticβ-cells is a hallmark of both development and progression of DM. We are interested in the mechanisms how elevated SUA levels can induce a loss of cell viably through inhibition of the mTOR cell survival pathway. Elevated SUA leads to a reduction in cell proliferation and metabolic activity, and an increase in apoptosis. DEPTOR, the negative regulator of the mTOR compexes is elevated under hyperuricemic conditions possibly due to a decrease in DEPTOR ubiquitination. The effects of elevated SUA are facilitated by uric acid transporters GLUT9, ABCG2 and MRP4." "It was my second time (attended also in 2017) I have attended the conference and both times I have enjoyed it very much. It is small but this is the beauty of it as you are in direct contact to many of the researchers. The venue for this is perfect and the field seems to grow in size, diversity and interest. Interestingly, I met some German researchers I want to collaborate with. It is an exciting field and one that will define how we see all the curent diseases hauting modern society in the future. My field is a little bit underrepresented, but especially by receiving this award I already told the organisers that this is about to change. 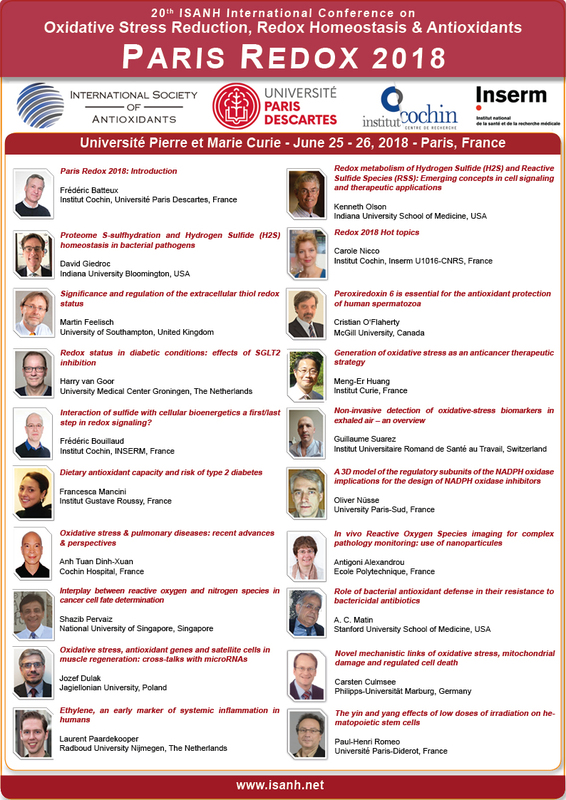 I will try to bring some uric acid researchers together for the meeting next year for a special session on this. I am already looking forward to next year to return to Paris and be more involved. Nice meeting, nice people, excellent organisation, will recommed it to others as well." For more information about Paris Redox 2018 awards, please click here.